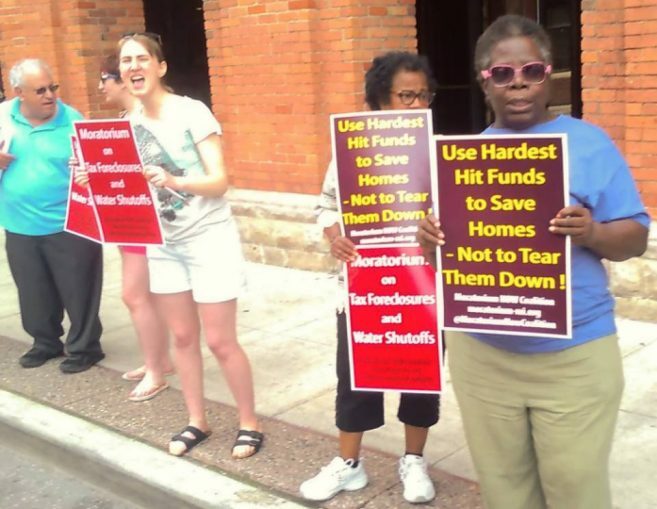 Activists held a day of protest against property tax foreclosures and water shutoffs in Detroit on June 28. Members of the Moratorium NOW! Coalition, Michigan Peoples Defense Network, Detroit Active and Retired Employee Association and other organizations first attended a 10 a.m. Michigan State Housing Development Authority board meeting to demand that federal Hardest Hit Funds be used to stabilize communities and not further the “cleansing” of working and oppressed people from the city. Later, the same organizations picketed the Wayne County Treasurer’s office during the noon hour to insist that a moratorium on foreclosures and evictions from occupied homes be declared to help maintain communities that are being devastated by the policies of the banks and their surrogates in local and state government.